To play with lightning speed you need sticks that are stronger, straighter and last longer. On-Stage found a quality wood that is perfect for just that. These maple drumsticks have been logged, air kiln dried, shaped, sanded and sealed, and ready to make some thunder! Choose between a nylon or wood tip in a variety of different sizes. 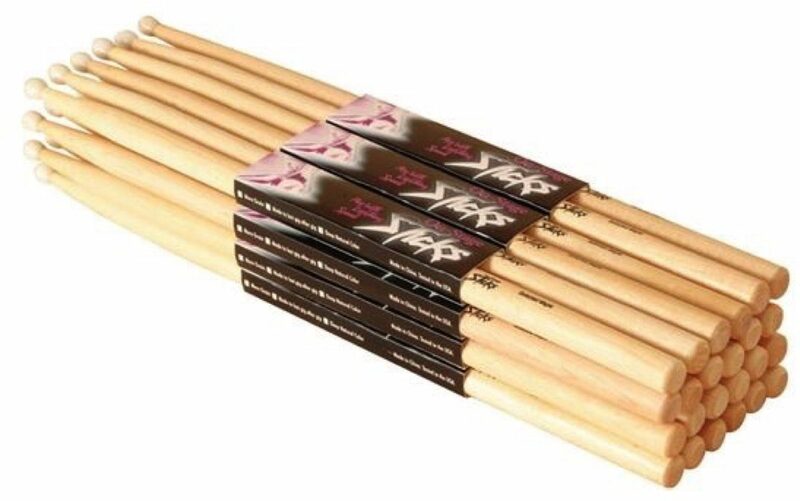 You can buy them in bricks of 12 pairs of sticks, so you won't have to order more for a while. "Worst durability in any stick ive ever had. " Overall: i liked how they felt and thought they played good. but before i even knew it, i was breaking them left and right. i broke six pairs in a 3 hour session today. thats not normal for any stick. i hit hard, but i dont hit THAT hard. bottom line: dont buy them if your in any way shape or form hitting hard, whatsoever. i have a cut on the side of my head from where one broke and hit me right on my temple. 71 of 75 people (94.67%) found this review helpful. Did you? Overall: Some of these stick have actually managed to keep their tips upwards of 20 minutes! The nylon tip flies off and then you get to search for it so it's sort of like an easter egg hunt in the middle of your jam session. I wish I hadn't bough such a large quantity. Tip for the tips: take a scrap of paper and put it over the stick, then jam that up into the tip. It holds much better but can still fly off.